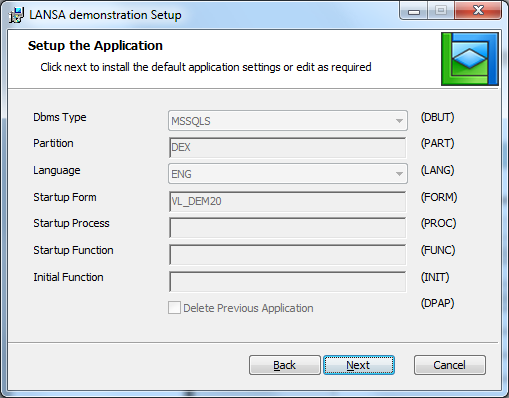 This dialog will only be displayed if the option Display Application Dialog is selected in the Deployment Tool options. The values provided on this dialog, and whether they can be modified is determined by the options selected in the Deployment Tool interface when defining the Application. Any value entered in the Startup Form, Startup Process or Startup Function indicates the DLL to be used to launch the application on completion of the wizard. Only one of these 3 options should be entered. Refer to Required Execution Parameters for more information. Confirm or modify any values as required then press Next to proceed through the install wizard.